Author Ben Yagoda joins the show to talk about teaching journalism, 40 years (!) of writing language columns, the influence of Harry Potter own his students, the history of the memoir , the mystery of why the “Great American Songbook ” withered after WWII, his hatred of the term “creative nonfiction”, the invasion of Britishisms into American English, our shared history in the Make-Believe Ballroom, the challenges of watching sporting events on tape delay, and more! (Also, I talk about the refugee-ban protests of the past weekend.) Give it a listen! 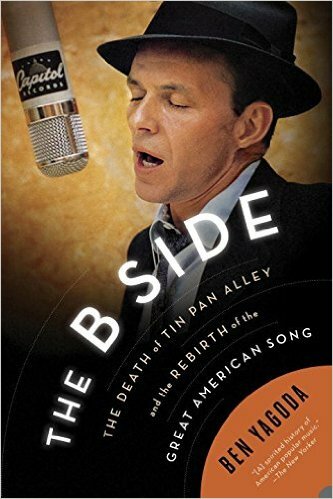 And go buy The B Side: The Death of Tin Pan Alley and the Rebirth of the Great American Song ! Ben Yagoda recently retired from teaching English, journalism and writing at the University of Delaware, and is the author, coauthor or editor of nine books. He has written about language, writing and other topics for Slate.com, the New York Times Book Review and Magazine, The American Scholar, Rolling Stone, Esquire, and many other publications. He contributes to Lingua Franca, a Chronicle of Higher Education blog about language and writing and Draft, a New York Times blog about the art of writing. His personal blog is Not One-Off Britishisms. He is on Twitter as @byagoda. He lives in Swarthmore, PA. Credits: This episode’s music is Nothing’s Gonna Bring Me Down by David Baerwald, used with permission from the artist. 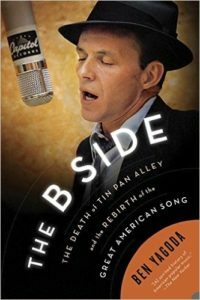 The conversation was recorded at Mr. Yagoda’s home on a pair of Blue enCORE 200 Microphones feeding into a Zoom H5 digital recorder. I recorded the intro and outro on a Heil PR-40 Dynamic Studio Recording Microphone feeding into a Cloudlifter CL-1 and a Mackie Onyx Blackjack 2×2 USB Recording Interface . All processing and editing done in Adobe Audition CC . Photo of Mr. Yagoda by me. It’s on my instagram, along with a double-selfie of us.